Today on the Feast of St Thomas Aquinas (d. 7 March 1274), commonly regarded as the Catholic Church’s greatest theologian and philosopher, the relics of the Dominican saint will be venerated in the Eglise des Jacobins in Toulouse, France. Among the notable absentees from the day’s solemnities held in Toulouse will be Thomas’ own right hand thumb, which adorns the Basilica di Sant’Eustorgio in Milan. 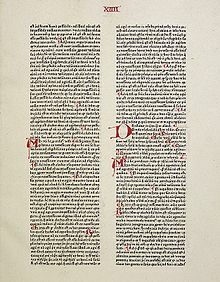 Upon at least two occasions and once during the season of Advent, St Thomas sojourned in the former Dominican monastery of Sant’Eustorgio in Milan, where the saint is said to have composed a few pages of his most famous work, Summa Theologiae. 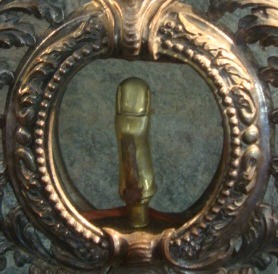 The thumb, associated with the art of writing and thus a fitting relic for bolstering the link between the Summa and the Milanese setting, has been placed inside a seventh- or eighteenth century reliquary monstrance and is on display at the museum of Sant’Eustorgio. Sant’Eustorgio became the Milanese seat of the Dominicans in the thirteenth century, but its association with the mendicant order ended in 1798 with the suppression of the monastery by the Cisalpine Republic. Today, while the Catholic world celebrates the Feast of St Thomas, there are no festivities planned at Sant’Eustorgio despite its possession of the saint’s relic and the church’s association with Thomas’ earthly life. 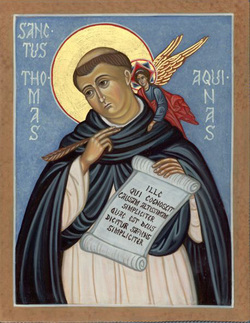 In fact, Thomas Aquinas is accorded only third place in the hierarchy of Sant’Eustorgio’s saints behind the Magi (Jan 6) and Peter of Verona (April 6). ‘We believe that the bodies of the saints and, above all, the relics of the martyrs, which are members of Christ, should be worshipped in all sincerity. . . . The person who has affection for anyone venerates whatever is left of that person after his or her death, not only the body and its various parts, but also the external things, such as clothing and personal items. So, it is clear that we should also show honor to the saints of God as being members of Christ and friends of God. We ought to honor any relics of theirs in a fitting manner, principally their bodies, which were temples of the Holy Spirit and are destined to be joined with the body of Christ in the future Resurrection. 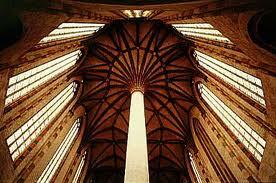 God fittingly honors these relics by working miracles at their presence’. While Sant’Eustorgio would eventually claim the saint’s right thumb, the history of Thomas’ relics focuses upon the locations of Fossanova, Italy and Toulouse, France. While en route to the Second Council of Lyon, Thomas died on March 7, 1274 in the Abbey of Fossanova, where he was initially buried. He was canonized in 1323 and his relics were translated from Fossanova to the Eglise des Jacobins in Toulouse (pictured below), the historic seat of the Dominican Order, on January 28, 1369. Between 1789 and 1974, the relics were held in the Basilique de Saint-Sernin in Toulouse before being restored to the Jacobins in 1974 on the nine hundredth anniversary of the saint’s death. Although saints are usually remembered on the day of their death, in the 1960s, in a move towards avoiding feast days during the season of Lent, the Church shifted the Feast of St Thomas from March 7 to January 28, the day of his translation to Toulouse. While his feast is being celebrated today in Toulouse, for six euros, the thumb of St Thomas can still be seen in the city of Milan.